Lush Fab Glam Inspired Lifestyle For The Modern Woman: Maximize Storage and Improve Design With Modern Furniture For Your Bathroom. Maximize Storage and Improve Design With Modern Furniture For Your Bathroom. Have you walked into a luxury hotel or modern restaurant's ladies or men's room and marveled at it's interior design, like the beautiful vanities and floating counters? And then remember that you have a small/cramped bathroom at home with little to no storage space? Finding the right furniture for your modern bathroom gives you the convenience and flexibility of upgrading the look of your bathroom and improving it's use by maximizing space, all while creating more areas for storage. We usually assume that having great storage is synonymous with installing large/bulky bathroom vanities, but the genius of modern designer furniture for bathroom is that they are made for small spaces. The construction size of new homes and apartments especially in populated city areas have decreased over the last few years. Living the average residents with smaller bathrooms to meet the needs of a couple or even a family of four or more, which can prove difficult. Today we are exploring the evolution of bathroom furniture design and introducing you to the myriad of practical, functional and innovative bathroom furniture that you can choose from. 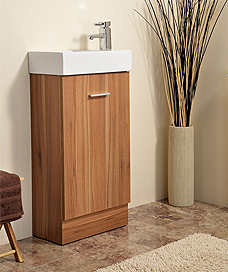 If you are planning a bathroom makeover or renovation with the purpose of increasing storage, overall space and aesthetic the AQVA Bathrooms furniture featured below may be exactly what you need. 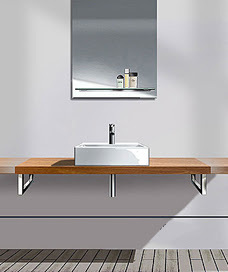 Modern Elegance Bathroom Furniture: Upgrade your bathroom and bring it into the 21st century with a modern and stylish floating worktop like the one shown above or the floating oak furniture pack and vanity featured below. Small Spaces Bathroom Furniture: The Cloakroom Vanity Unit below is ideal for small spaces, like a powder room guest or children's washroom. The slim size allows it to take up very little room in your small space, while providing you with the functionality you need. Bathroom Storage Furniture: Whether you have a small or large washroom, you could always make-do with more space to store toiletries, towels, makeup etc. 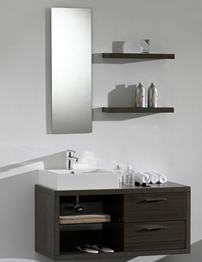 See the bathroom furniture options featured below that are perfect for storage and organization. 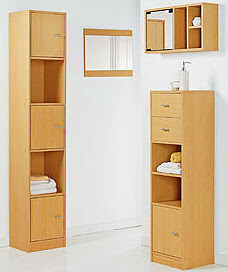 The Tall Bathroom units above maximizes space by providing vertical storage on walls that usually remain unused. This Mobile Storage Unit provides flexibility and quick/easy access to your items. 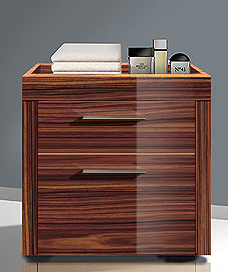 This traditional Bathroom Vanity is elegant and classic with modern elements and it contains numerous draws for you to properly organize and store your items. Which modern bathroom furniture would you love to have in your home? Leave a comment below. 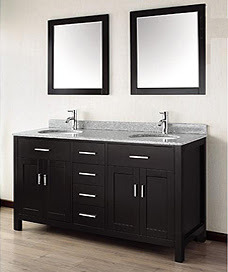 Found the great information What a great This traditional Bathroom Vanity is elegant and classic with modern elements and so pretty really fresh!